Next to one of the more popular canals in Amsterdam, the Prinsengracht, you find cafetaria/grill restaurant De Fles (The Bottle). This is a place, more than just for people walking by, but it is a spot for the real grill lovers. Next to great steaks or fish on grill that you can order here, you can also enjoy a shared dining table 'cheese fondue' with friends. 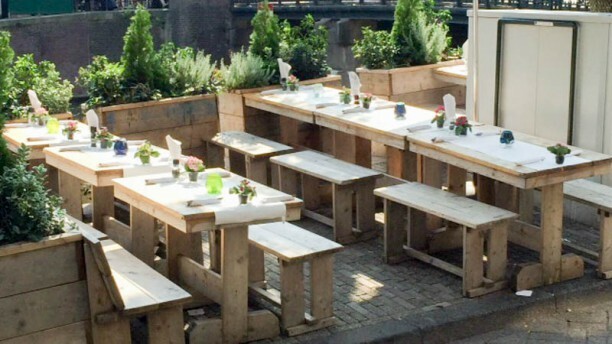 Take a seat on their sunny terrace along the canal and enjoy the grill! Let op, Eetcafé De Fles zit in het souterrain, dus links de trap naar beneden nemen. Had a tasty meal here this evening. I had the salad of the week which was goats cheese with a raspberry sauce which was delicious with fresh raspberries, blueberries and blackberries adding to one of the most interesting salads I have had in a long time. My wife had the pasta of the week which was a ravioli which looked and smelt delicious too and by all accounts was. Friendly unhurried service rounded off a very pleasant evening. This is one of the absolute best restaurants in Amsterdam. The food is amazing and comes at a very reasonable price, atmosphere is great and the service is unbeatable. Been here many times and will keep on coming back. The bar/ restaurant had a really nice atmosphere with nice beers on the card a from the tap. I didn’t really like the food though fries were nice but the meat (I had steak) was just not nice at all. Fully well done and horrible taste felt like it came from a dirty grill. Very good place. The owner is amazing, very friendly! The dishes are well served. Great dinner. Watched the Chef as he prepared dishes all by himself. Nice atmosphere and excellent service.